OnBoardify is the #1 onboarding automation platform for web and mobile apps. OnBoardify is the #1 onboarding automation platform for online businesses. Our cloud service is used by startups, SaaS companies, and enterprises to connect and onboard site visitors and application users. By automating the onboarding of mission-critical web and mobile sites and applications, we accelerate conversions of trials and evaluations, retention of customers, and adoption by users. Integrate Zendesk escalation into your application or web site. Have Zendesk agents directly collaborate with application users with in-app messages, onboarding and file sharing. 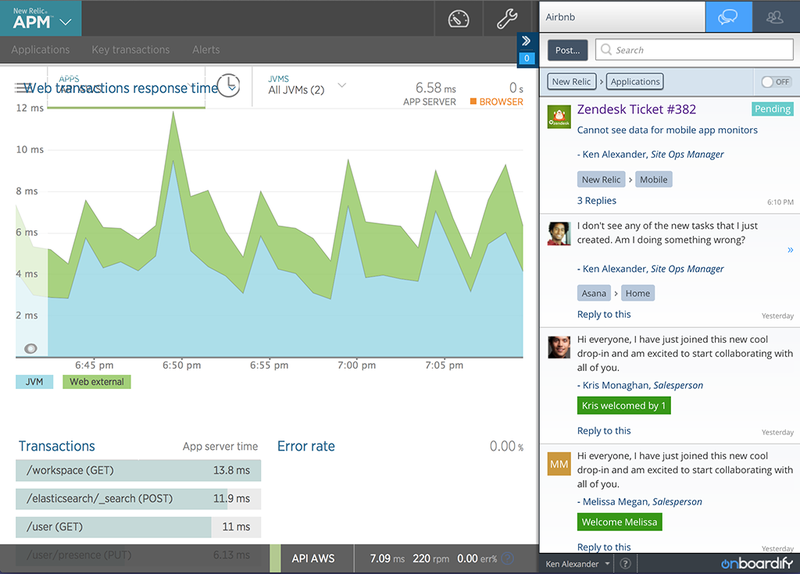 Send immediate notifications to Salesforce and Chatter when users ask questions or escalate problems to Zendesk. 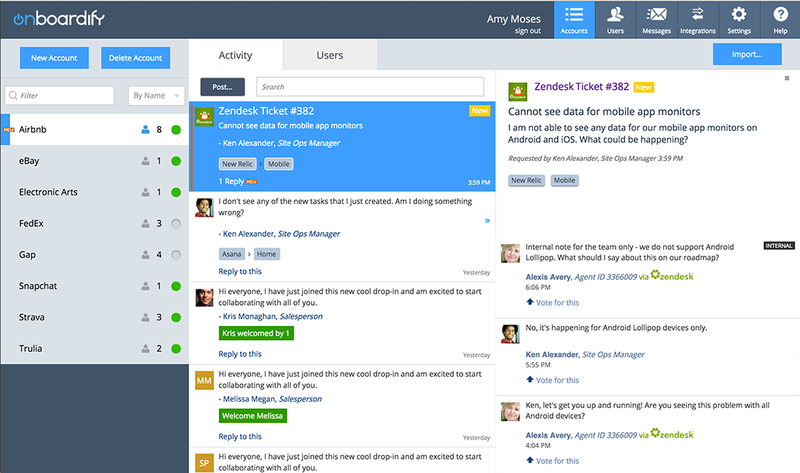 Instantly communicate ticket status and updates to customers and team members not using Zendesk. The ability to connect to your application users from Zendesk is available to any OnBoardify customer or prospect. If you are not yet using OnBoardify, please go to www.onboardify.com to signup, or call 1-415-529-2707. You will need to be an Admin of your Zendesk account to add the Zendesk integration to OnBoardify. Login to the OnBoardify portal. Add a new Zendesk integration in Integrations. Enter your Zendesk domain, user login, and API token. Press the Authenticate button to save your Zendesk account credentials. 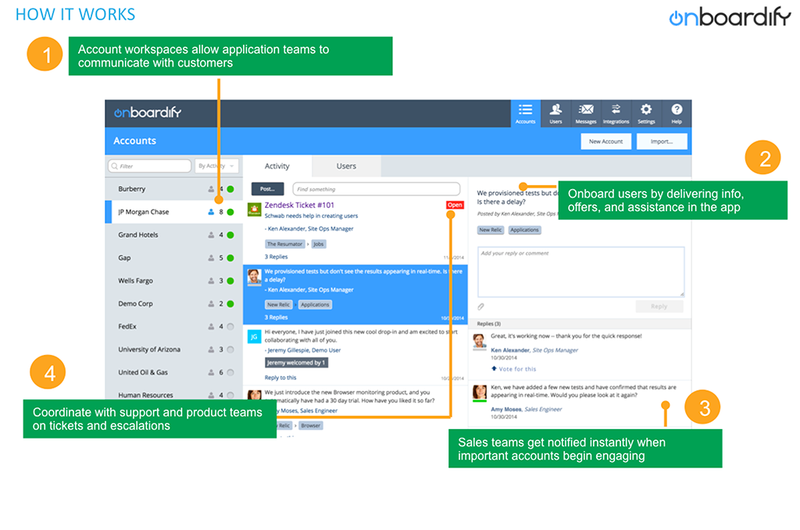 To view the Zendesk-OnBoardify docs, please see the OnBoardify help site.